Susanna has been teaching privately, and at the mid and high school levels since 2004. 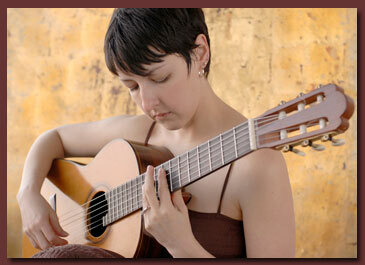 A regular fixture in Albuquerque's classical guitar community, she has been a finalist and prize winner in several international competitions, including the Texas Guitar Competition and the Sholin Guitar Competition in Tuscon, Arizona. Susanna has had master classes with some of the world's best guitarist including; David Russel, the Assad Brothers, and Anitgoni Goni. Susanna has students of all ages and levels and concentrates on classical guitar and fundamentals of music, and has taught at Baum's Music for 8 years. Ms. Garcia earned her bachelor's of Music in guitar performance from the University of New Mexico where she studied under Michael Chapdelaine; she attended the University of Arizona where she studied with noted pedagogue Thomas Patterson.